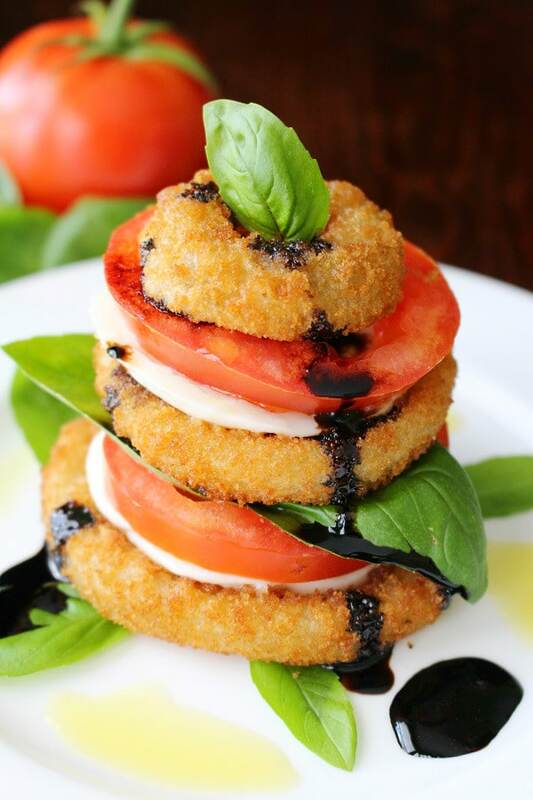 Give your classic Italian caprese salad a twist by stacking it on crispy onion rings! Perfect for a light lunch or a delicious appetizer. You’ve probably heard of the classic Italian caprese salad. Thick slices of mozzarella and fresh tomatoes, garnished with fresh basil, drizzled with olive oil or balsamic reduction. 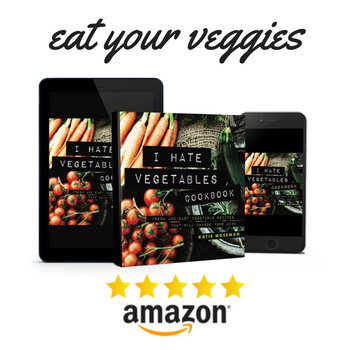 I’ve seen many variations over the years, from a strawberry caprese salad to many others. 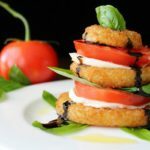 Today, I’m going to show you how to put together a quick and delicious caprese salad using crispy onion rings! Why onion rings? Well, to start, it’s a texture thing. The combination of crunchy, soft, and juicy hits something close to perfection. Of course, it’s all about the flavor, too. 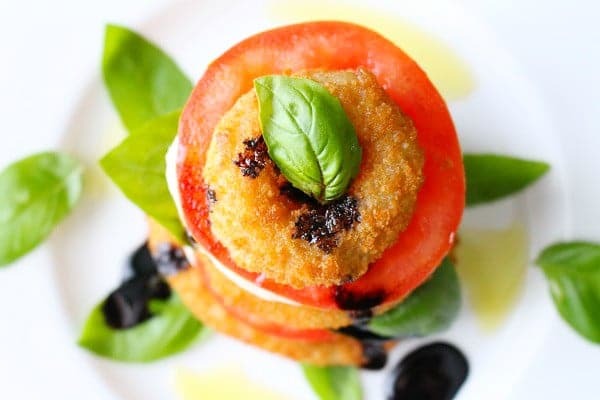 Sweet tomatoes, salty onion rings, piquant balsamic reduction, fragrant olive oil, and the herbal tang of basil combine to delight the palate with every bite. I made these for lunch one day and it was an absolute treat. 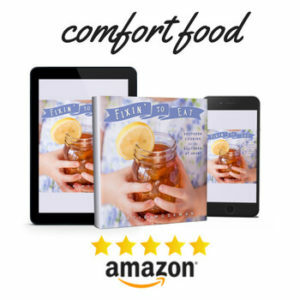 I highly recommend them as a light lunch, a snack or appetizer, or a surprise first course when entertaining. They’re absolutely beautiful to look at, too. If you get to give these tasty stacks a try, leave a comment and let me know how you liked this variation on caprese salad! Preheat the oven according to the frozen onion ring package directions, and line a baking sheet with parchment paper or foil. Once the oven is preheated, place the frozen onion rings on the baking sheet and bake according to package directions. While the onion rings are in the oven, place the balsamic vinegar in a saucepan and bring to a boil. Reduce heat to medium low and let simmer for about 5 to 10 minutes or until slightly thickened and able to coat a spoon (the consistency of maple syrup). Set aside to cool. Cut the mozzarella into rounds. Rinse the basil and pat dry. Slice the tomatoes and allow extra liquid to drain away. When the onion rings are done, let cool slightly before handling. To make the stacks, nest smaller onion rings inside the largest onion rings to make a base. Stack the cheese on top, then add a layer of basil leaves, then top with a tomato slice. Continue making stacks until you have used up all the onion rings. If you have broken onion rings, you can use toothpicks to make miniature kebabs with pieces of onion ring, tomato, basil, and cheese. Arrange the stacks on plates, then drizzle with olive oil and balsamic vinegar reduction. Garnish with a sprinkle of chopped basil, then serve. Alexia onion rings are fantastic! 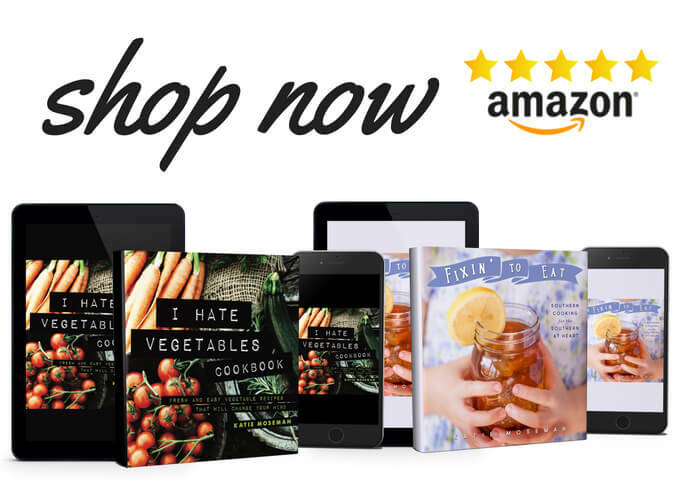 Love your idea of using them in a caprese salad! So pretty! what a delicious twist on a caprese!! This is such a creative idea!! I love caprese salad, and adding onions rings in genius! Yes to every part of that! This is genius! I love onion rings, they are one big splurge and I live on Caprese all summer long. Great recipe! This is such a great idea!! These look awesome! The perfect way to add a little crunch to a caprese salad! wow.. the onion rings look amazing and enticing. Wow! 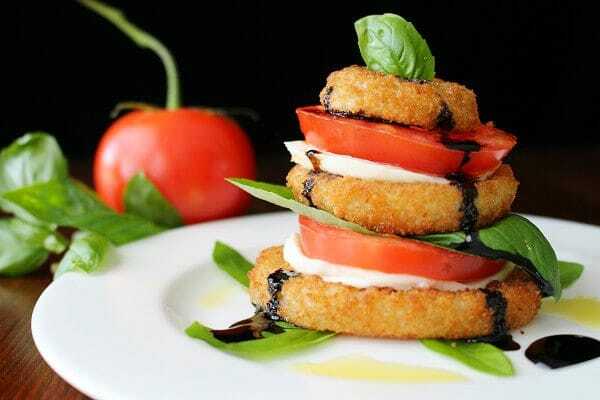 I love Caprese Salads and I love Onion Rings – NEVER would I have thought about putting the two together. I have to try this! I like how you can bake the Alexia onion rings instead of fry them. Cheers for the inspiration! Alexia makes really good bakeable snacks. Thanks for stopping by!